This Is My Million Dollar Year. ONLY ONE DAY LEFT! I bought ten lottery tickets today and won two free plays and $20. So there's still kick in this dog yet. Also, I'm going to be on CBC Radio's Here and Now on Monday! It's on between 3 and 6pm, but I don't know what time I'm on until Monday morning. FM 99.1 in Toronto. Screening party is coming up fast, this THURSDAY, DECEMBER 1ST to be exact! If you want more info, click here to see the flyer! Heard about My Million Dollar Bake Sale? I made cookies just for you! Check em out! Also, have you heard that I'm throwing a party? 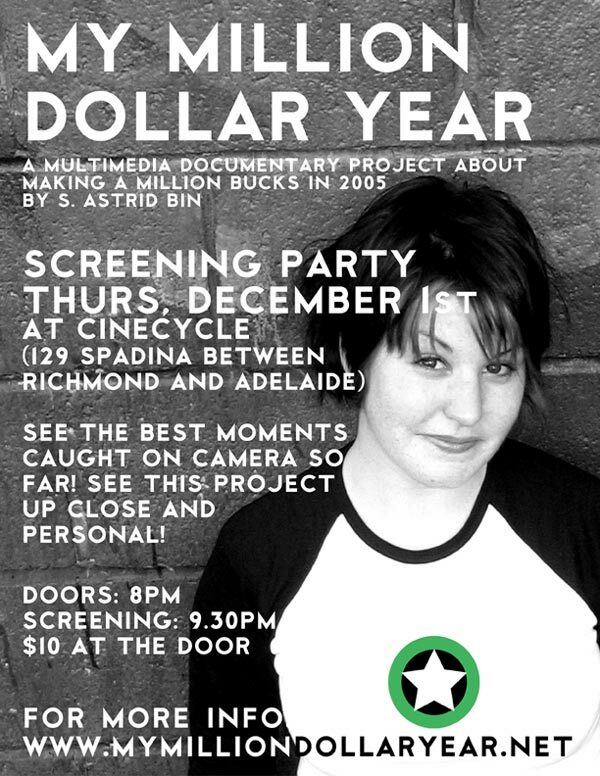 It's on THURSDAY DECEMBER 1st, at Cinecycle (behind 129 Spadina St, between Adelaide and Richmond), at 8pm! Installations of selected documentation and artifacts, and a screening of compiled video footage from the year thus far! People keep emailing me these days and telling me how great this project is. And I appreciate it and all, I really do, but an even better use of those words has been brought to my attention, which is that they should be emailed to Conan O'Brien so he'll have me on his show. I've got about 4,500 of you coming here every day, and I think a group project is in order! Lately has not been easy, but the lesson of the month is It Won't Be This Way Forever. BUT! The first installment of the My Million Dollar Road Trip Diaries are up! Pictures, stories, oh my! Click and see, more coming this week. Home from the road trip, barely recovered over the last week. I didn't know how much of a hit I'd take physically from 33 days on the road. All in all though, a productive trip ... have you seen the press?! Driving to Seattle over today and tomorrow! And so ends the first week on My Million Dollar Road Trip, and thanks to a couple of hours with a net connection, I have updated the crap outta this site. The biggest development is that I have added Podcasts to the site, which means that you can listen to audio (and perhaps, later, video) that's recorded on the road. Due to lack of processor power while on the road the video probably won't happen until later, but the audio is happening now! What's a podcast? It's just like a radio show, that you can download and burn to CD, listen to on your iPod, or listen to on your computer. This is a medium that is exploding in popularity, so click here and learn about it and stay in the loop, dig? Also updated ... PICTURES! Check the blog! 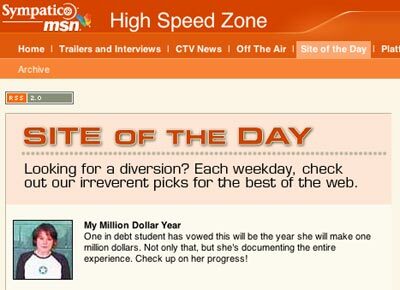 First: Check out my appearance on Breakfast Television by clicking here! Everyone was impressed with my mad Etch-A-Sketch skillz. Second: I was in Dose Magazine yesterday! A big picture in the paper, I was a little surprised when I opened it. Click here to read the article! Third: Holy crap I'm leaving on a road trip tomorrow!!! If you haven't heard, click here to read all about it! It's going to be crazy, I'll be updating (and hopefully Podcasting) from the road, watch for updates! I'll be coming to a town near you with a car full of Jones Soda! I hope you're ready. I'm going to be on TV on Tuesday, on Breakfast Television, Toronto's #1 morning show! It's on CityTV from 6-9am, so if you're up at that ungodly hour tune in. If not, set your VCR! ALSO ... I added a new product to the Stuff Page, where you can buy personalized things that aren't necessarily one of a kinds but are still damn cool (like copies of my hate mail). I'm selling post cards from the road on My Million Dollar Road Trip, a personalized post card from a random location, written and addressed by yours truly! Click the link to check it out! ROADTRIP!! I'm leaving July 15th, as it turns out. Read about the whole thing here! Everything's fixed that was broken. All it took was a couple of hours of outage and a stroke on my part. But everything's good! If anything is out of place let me know, because I may have lost a couple of bits and pieces in all the hubub. Guess who was MSN.ca's Site of the Day today! I kept the trailer under wraps for a bit, but screw that. Go watch it here. It's actually more of a mini movie, and is low-quality as to not explode bandwidth, but the great news is that it's a piddly four megs. There I go sending the love out to the dialup users, once again. Higher res version to follow when I get a minute. See that number on the right? That's the smell of progress. Trailer is coming together. Get your BitTorrents ready. Someone gave me a fabulous idea today - get an AIM account for this project. So I did. If you use AOL Instant Messanger, I'll be sporadically online under mymillionyear. Add me to your buddy list, and say hi. 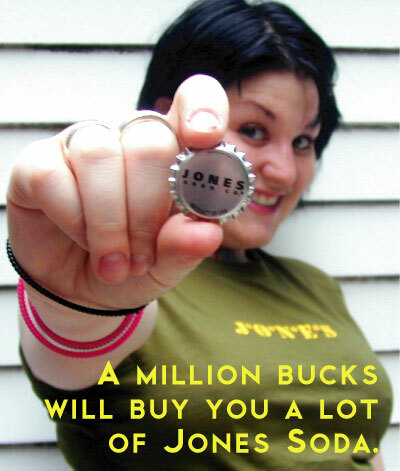 Great news - Jones Soda has agreed to be one of the sponsors of My Million Dollar Road Trip! Click their link in the Sponsor page, it's a kickass website. New artifacts for sale! Some really great stuff, more being added soon. I've been collecting a lot of stuff. LA pictures and stories are online! Photographic evidence! Unfortunately there aren't nearly as many still photos as there are hours of footage, but they're pretty funny nonetheless. Read about it in the blog! More pics! LA was hilarious, you wouldn't believe it. I have a bunch of still photos, many of which are out of focus because the person holding the camera was laughing so hard. Look for the Los Angeles Photo Diary that'll be up soon! Total has also gone up, yay! 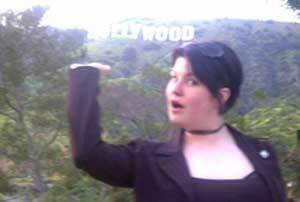 I'm going to Los Angeles today, to see how much ridiculousness I can create for myself in ten short days (including, but not limited to, attending a taping of the Price Is Right in hopes of winning a Fabulous Array Of Prizes, and trying out for Jeopardy). I'm going to be on Dicky Barrett's Mighty Morning Show on Indie 103.5 in Los Angeles on Thursday March 31 (right before I try out for Jeopardy! ), so tune in if you're able. Enough of all this gloom. The February blahs came and found me a month late it seems and sucked up any productivity I could have mustered over the last few days. Good news: I'm on fire again. More good news: 325,000 hits to this site since January 1st. Oh my! Even more good news: New pictures up on each page! I hated to retire the little devil thingy I had but it was only intended to be temporary. YET MORE good news: The Best Of page has been updated with the good moments of the year thus far. All in one place! How convenient! Look what I did yesterday! I added a new section today, for Other Stuff that's not really an artifact but still original. The reason for this was I needed a good home for somewhere to sell copies of hate mail, and a BRAND NEW SERVICE I'm offering. I get the impression that a lot of people that write to me - both love and hate mail - would really like to talk to me personally. So now you can. I'll call you, at my own expense, and you can say whatever you want to me, ask me things, confess things, yell things. Visit the Other Stuff page to check it out! It's Valentine's Day. I posted what I'm listening to because these songs make a good mix tape - nothing's cheaper or more of a crowd pleaser than a well-sequenced mix tape or CD. I was on CBC's "The Hour" tonight on CBC Newsworld, which is aired at 8pm, 11pm, and 2am EST (check www.cbc.ca/thehour for more details). Yay! Big props to GoldenPalace.com, my illustrious sponsors who paid me to wear their name on my shirt! And because I love you, I've posted Love Mail and Hate Mail in the Mailbag section of the site for your perusal and amusement! Check it out! Three cheers for organization: I've made a section to keep all the statements about art and Profitism (my brand-new art movement) so they're easy to find. Even contains a link at the bottom so you can send me scathing hate mail. Check it out. All kidding aside, I totally welcome comments, positive and negative. I'm working in a vacuum here so I appreciate input! You kept asking for it, it's finally here ... the first installment of my explanation of this project as art. Will be expanded as necessary. Ebay axed the listings again ... I have no idea why this time. I'm starting to take it personally. I think I'm just going to list this stuff on the artifacts page again ... if you've got any bright ideas, I'm all ears. Updated the About This Project page. I've decided to do this once a month to keep track of what I feel I'm doing, as the dominant ideas seem to shift the further into this I get. Not to be defeated, I'm listing items on Ebay again!! Click the link to see ephemera for sale. Get it while it's still cheap! Time to start listing on Ebay! Hurray! Had an epiphany today. You can read about it in the blog. Bookmark it while you're there. Changes to the mailbag section of the site! Better and more hilarious than ever! NEW ARTIFACTS FOR SALE! I refuse to spend time responding to and correcting the spelling and grammar in each piece of hatemail, because it would take me forever, it means I would have to say the same things over and over again, and basically it doesn't interest me and doesn't get me any closer to a million bananas. But what to do with all this fantastic material? I've decided to do something constructive with it: Since I'm not bothering to post the hatemail on this site you won't ever get to read it. UNTIL NOW!! You can now buy a copy of My Million Dollar Hatemail for the bargain price of $20 CDN! Perfect for gifts for distasteful in-laws, terrible bosses, and general enemies. MY MILLION DOLLAR YEAR ON MYSPACE! My Million Dollar Year now has an account on the online community site MySpace! Visit http://www.myspace.com/mymilliondollaryear to check it out! ARTIFACTS FOR SALE!! An important part of this project is the objects used and associated with it, as they are telling of the events that transpired. They're even more telling of the person who used them. I've been wrestling with it for awhile, but I finally decided how I want to sell the stuff that's produced by this project. A few of the artifacts from the first week, as well as the first original tapes, are for sale in the artifacts section. So the last few days have sucked. That's not for you to worry about. The only thing you need to decide is how many of the NEW SHIRTS you need to buy. I recommend keeping one nice for weddings and job interviews. Fully recovered from the little outage yesterday afternoon, to the best of my knowledge anyway. If something's missing, let me know. Want to know how to make Astrid lose her mind? Get her ftp client to stall while downloading a backup of the site and delete everything. There was an outage at about 2.20pm EST. I've uploaded a slightly older version of the site until I can get to the computer that has the newest version. I think I just aged about ten years. January 1st, 2005 marks the launch of My Million Dollar Year, the year in which I make a million dollars. Check out the links at the top of this section to find out more, and use the links at the top of the site to check out the other sections. (Don't forget to bookmark the blog! To find out how you can get in on this, check out the Contribute section.